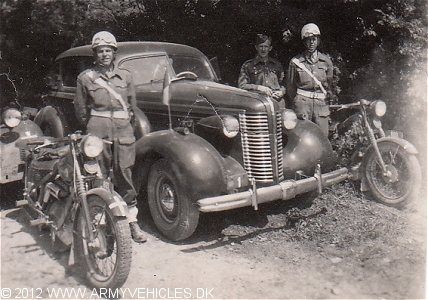 Danish Army Specific: The Buick was used by General Ebbe Gørtz just after WW II. It appears that the picture was taken during a visit at the Danish Brigade in Germany. It´s probably a 1938 or 1939 model. Historical: The origins of the Roadmaster name date to 1936 when Buick added names to its entire model lineup to celebrate the engineering improvements and design advancements over their 1935 models. Buick's Series 40 was named the Special, the Series 60 was named the Century and the Series 90 — Buick's largest and most luxurious vehicle — was named the Limited. The Series 50 was retired, but new for the model year was the Series 80 Roadmaster. . Length: 5.41 m (213 inches). Width: 1.91 m (75 inches). Height: 1.72 m (68 inches). Engine: Own 8-cylinder, 5.200 cm3 (320 cubic inches) displacement, water cooled.